Posted on Mon, Jan 23, 2012 : 11:15 a.m. The Kentucky Fried Chicken restaurant near Washtenaw Avenue and US-23 was robbed about 10 a.m. this morning, Pittsfield Township police said. 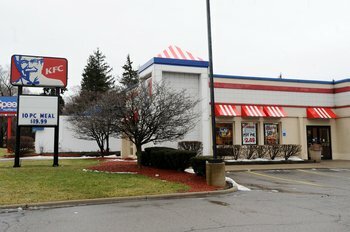 A man robbed this Kentucky Fried Chicken restaurant, located at 4040 Washtenaw Ave., at gunpoint on Monday morning. A message from Pittsfield Township police said a man entered the restaurant, 4040 Washtenaw Ave., showed a handgun, then fled with an undisclosed amount of money. The restaurant is across the street from the Washtenaw County Service Center, which houses the county jail. The robber was described as a black male in his early 20s who was last seen wearing a black jacket, dark blue sweater, black pants and something dark covering his mouth. The robber may have fled in a black Hyundai Sonata, police said. A message Ann Arbor school district spokeswoman Liz Margolis sent to parents of students at nearby Carpenter Elementary School said an armed robbery occurred about 10 a.m., and as a precaution police asked school officials to lock down all perimeter doors until 11 a.m. It was the second armed robbery in two weeks in the area. On Jan. 9, a man robbed a Sunoco gas station in the 4000 block of Washtenaw Avenue. Anyone who witnessed the incident or who may have additional information is asked to call the Pittsfield Township Police Department at 734-822-4911. Tue, Jan 24, 2012 : 3:29 p.m.
Have you seen the price for a bucket of chicken lately? Mon, Jan 23, 2012 : 9:49 p.m. I am wondering if and when this person is caught what his bail will be set at. If you steal $100k you get to appear based on a promise <a href="http://annarbor.com/news/crime/man-accused-of-embezzling-more-than-100000-from-ann-arbor-business/">http://annarbor.com/news/crime/man-accused-of-embezzling-more-than-100000-from-ann-arbor-business/</a> Remember people, it pays to commit white collar crime. Tue, Jan 24, 2012 : 12:37 a.m.
No johnnya2, it doesn't &quot;pay&quot; to commit white collar crime. White collar criminals with property, family and other community connections don't flee as often as people who commit armed robbery, and risk of flight is what determines bail. Rutter got a personal recognizance bond because the court is confident he will show for trial. Someone who commits armed robbery is also less likely to receive bail because it's a crime of violence, and the accused presents a greater risk to public safety. Mon, Jan 23, 2012 : 8:43 p.m. Same KFC where my husband and I were waiting in line to order and a woman ahead of us approached the counter asking for a refund for a meal (she had the meal with her) she had purchased THE WEEK BEFORE! She said it didn't taste right. Well, I would guess if she had just tried it that day, it wouldn't have tasted very good. I don't think I've shaken with laughter that hard before or since. Mon, Jan 23, 2012 : 8:12 p.m. Sounds like someone knew that they could gain entry to the building from the back door while the delivery driver had it open to wheel in his products. At this time of day, the manager might be taking the money outof the safe to be put into the till or count last night's receipts. Maybe an inside job, boyfriend of a current employee or even a former employee who knew the routine. Tue, Jan 24, 2012 : 2:01 a.m.
You make some good points..im pretty sure Kentucky fried cat doesn't serve breakfast. Someone had to have an ideas about how things worked there. Mon, Jan 23, 2012 : 7:42 p.m.
Are they even open at that time? I know employees would be there but they don't serve breakfast right? They probably open like 10:30/11:00. Mon, Jan 23, 2012 : 7:28 p.m.
Next: someone robs 14A-1District Court. Isn't this getting a little embarrassing for the County Sheriff? Tue, Jan 24, 2012 : 12:40 a.m.
&quot;what does the county sheriff have to do with this?&quot; The County Sheriff's office is directly across the street from the KFC. In fact, you can see the KFC from the window of Juvenile Detention. Mon, Jan 23, 2012 : 9:39 p.m.
Only if they dont catch him, oh wait what does the county sheriff have to do with this? Mon, Jan 23, 2012 : 6 p.m.
Mon, Jan 23, 2012 : 5:56 p.m. If the east side of AA had a police presence like the east side of Dearborn has, stuff like this would not be so common. All these fools on city council won't do it. If you live on the east side of AA, move. That seems to be the only solution. Mon, Jan 23, 2012 : 9:45 p.m.
@Ron Granger STOP that now, You will screw up the whole mind set if you give statistics and facts. Mon, Jan 23, 2012 : 6:41 p.m. This is Pittsfield Township, not Ann Arbor. Mon, Jan 23, 2012 : 5:39 p.m.
People are so desperate, and do desperate things. (no excuse) I haven't heard yet what came of the person (in an orange coat) that filled a large purse with booze at Meijers. This was a good call, Police were called and she was exiting. I'm guessing this person was caught. Bright ORANGE coat? How could this be missed? Mon, Jan 23, 2012 : 5:33 p.m. The Sunoco station gets robbed. Then the KFC gets robbed. So, if I'm working at Speedy Muffler King, am I worried? Mon, Jan 23, 2012 : 5:27 p.m. I wondered what was going on.. I went through there this morning! CRAZY..Time are tough! Mon, Jan 23, 2012 : 5:05 p.m. I went by this shortly after it happened, and it looks like there was also an accident between a PTPD squad car and another vehicle on the road just east of the KFC. There was also a delivery truck in the parking lot. The driver was just sitting there with a look on his face that suggests he was wondering when he might get back on his route and get home tonight. With respect to robbing a KFC at this time, I Have to guess the individual knew a little about the restaurant's operations. The staff were probably getting money out of the safe for the tills, and perhaps to pay the delivery driver, although that practice is not as common as it once was. Thank you a2citizen, that is why I prefaced it with &quot;perhaps&quot;. That being said, the delivery driver was blocked in by patrol vehicles, I am sure he wasn't planning on a full morning stop in Ann Arbor. Mon, Jan 23, 2012 : 5:28 p.m.
Mon, Jan 23, 2012 : 5:26 p.m.
Dispatch said he ran out the back door with a bag of money. They were calling for tracking dogs. Mon, Jan 23, 2012 : 4:55 p.m.
Mon, Jan 23, 2012 : 4:53 p.m.
One would think no one across from a jail would be robbed. Mon, Jan 23, 2012 : 4:36 p.m. This reminds me... Whatever happened to that woman who was accused of using bad gift cards to steal a deep fat fryer this past Summer? Mon, Jan 23, 2012 : 4:33 p.m.
How much money can a KFC have at 10am??? Tue, Jan 24, 2012 : 6:12 a.m. They could have the receipts from the previous day. Many businesses do not make night drop deposits after closing and go to the bank in the morning instead. Tue, Jan 24, 2012 : 12:30 a.m. I'm thinking it was one of the folks that couldn't get a greasy chicken fix at old country buffet...had to stop by KFC. Mon, Jan 23, 2012 : 4:37 p.m.